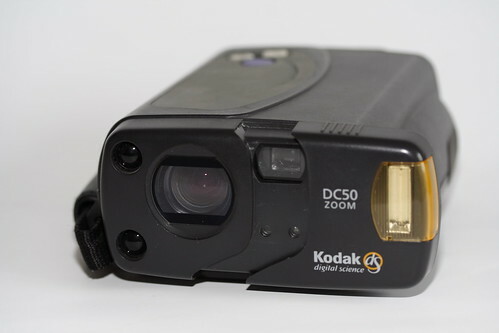 The DC50 is a early digital camera released by Kodak in 1996. 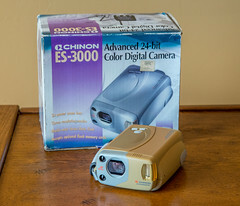 Although marketed by Kodak, the camera was made by Chinon and was available as an OEM-model. 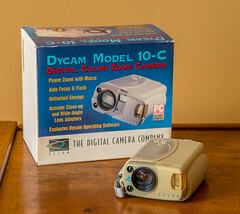 Therefore the same camera was available as under the following brands: Dycam Model 10-C and Chinon ES-3000. 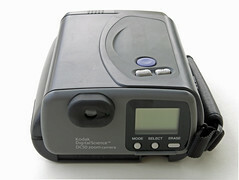 The front of the camera has a sliding viewfinder cover that also operates as the power switch. The camera does go to sleep if inactive for 1, 2 or 4 minutes depending on settings. The LCD panel on the back displays information such as auto focus point, exposure compensation, flash (auto, on, off), picture quality, self-timer, erase status, card status, copy status, exposure counter, exposure remaining, and battery level. Exposure: programmed automatic exposure with shutter speeds 1/16 to 1/500 sec. Interface: RS232C/RS422 serial connector, 115 Kbit/sec. This page was last edited on 30 April 2018, at 05:14.